With Notorious out on DVD today, you know we had to holla at the number one (and, uh, TWOs) star of the movie. 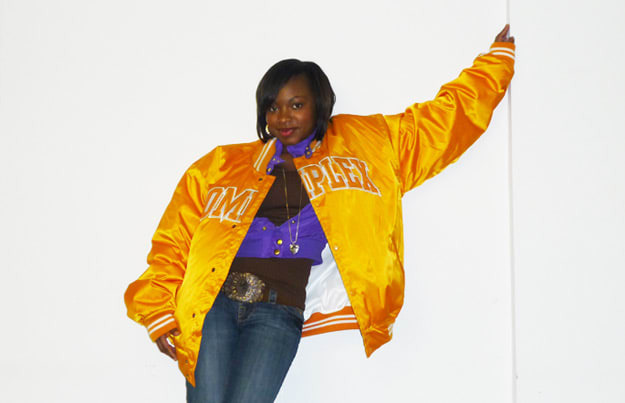 Sure, Gravy did his thing and all, but pause buttons were made for Naturi Naughton. Screw a bootleg—now we can finally analyze her memorable scenes in HD! Naturi says: This video is incredible. It&apos;s kind of funny to look at an old Fame video like this and think that I&apos;m doing a modernized version of this great film from the &apos;80s. Watching this video helped me realize how fortunate I am because this is a film that a lot of people are familiar with and have had a connection with for a long time. When people hear the theme song from Fame it brings them back to when they were growing up and to be a part of something like that is pretty cool. Naturi says: Oh no! This is a throwback. I cannot believe you guys found this. I haven&apos;t seen this in like forever. Look at Lil&apos; Romeo. Oh my gosh! This was forever ago. I was like 16 years old. This is from when Nickelodeon just launched Jimmy Neutron. This was the single and theme song for the movie. It&apos;s funny because I just saw Nick Cannon the other day and it&apos;s like, wow, look how much history I&apos;ve had with people in the business. You always end up crossing a person&apos;s path again. That&apos;s why you have to always do right and treat people right. Jessy Terrero shot this actual video. This is actually his directorial debut and now he&apos;s shooting a lot of 50 Cent videos. We had so much fun shooting this video in L.A.
Naturi says: Oh my gosh! Why are you doing this to me? This is even further back around the time "Playas Gon&apos; Play" came out. This is in L.A. We lived in L.A. during the process of recording our second album. It&apos;s weird looking at myself that long ago. Look at my clothes and my hair. I would have definitely done a lot of things differently. Naturi says: Wow. I remember this. I remember everything. Especially when I see the images. I remember being at home watching this. I watched this live. I really don&apos;t like looking at videos like this and it&apos;s one of those things that&apos;s petty. I look back at moments like those and I just remember that I am so much better and stronger because of all of those moments. So when I look at old videos like this I think, wow, Naturi you are strong, you are blessed, and you are so much bigger then drama. It&apos;s a reminder of where I&apos;ve come from and where I&apos;m at now. Naturi says: Oh. I never saw this... All I have to say is, I didn&apos;t write the script, I didn&apos;t cast, produce or direct. I&apos;m just an actress who put in her work. And as far as her saying that I never reached out to her; that is totally untrue. I would never want to play a real-life person without trying to contact them. The acting that I did is because I had a great director, a great acting coach and great co-stars. We did some great work and I&apos;m not going to water down anything because someone feels like they should have had their way. Who knows it could have worked both ways. Talking to someone and listening to what they have to say could make you nervous—you stop focusing, you start doubting your own work, and you start trying to please them instead of focusing on the acting. I&apos;m an actress and I&apos;m going to do me at the end of the day. It&apos;s no disrespect to anybody but I&apos;m here to do me in this world and I definitely tried my best to have the input of Lil&apos; Kim and it did not happen. And I have so much respect for Kim. When I got the role I was like, I have to speak to Kim, so I reached out to [Lance] Un [Rivera] and there was conversation after conversation with Un but I never got any feedback from Kim.